Troubleshooting your appliance gives you valuable information and can save you money, Even when you hire a licensed technician to do the repairs, ordering the appliance parts yourself is often less expensive than having the repair company order them for you. We’ve compiled a list of common reasons an oven won’t heat and related oven repair parts to help you along the way. Problem: A failed igniter is one of the most common reasons an oven won’t heat, because the igniter is the most commonly failed component of the oven. The igniter draws electrical current through the oven safety valve to open it. If the igniter is weak, the valve won’t open and the oven won’t heat. Observe the igniter while the oven is on to verify that it glows red and ignites the flame. If the igniter glows for more than about 90 seconds without igniting the gas flame, it should be replaced. Parts: Igniter- Know your oven model to order the correct part. Problem: The spark electrode is housed next to each burner and is used to ignite the gas. If the electrode is broken, worn out, or damaged it may not create the spark to ignite the gas. Check both the porcelain housing and the electrode itself to make sure there are no visible cracks or damage. If the electrode is damaged in any way, replace it. Parts: Spark Electrode- Know your oven model to order the correct part. Problem: One of the wires that supplies power to the igniter and the oven element could be burned out. These are common oven repair parts, as the wires tend to burn out near the heat source. Inspect the wires leading to the element and the igniter. If the wires are burnt, it will usually be visible. If they look good, check to make sure they aren’t loose or disconnected. Parts: New Wires- Know your oven model to order the correct part. Problem: The igniter works in conjunction with the oven safety valve to ignite the gas for the burner. If the safety valve doesn’t open, the igniter will fail and the oven won’t heat. Be sure to check the other igniter components first; if you have already inspected the spark electrodes and wires to ensure those are not faulty in any way, you may have a defective safety valve. Use a multimeter to test the safety valve for continuity. If there is no continuity, the safety valve needs replacement. Parts: Safety Valve- Know your oven model to order the correct part. Problem: The oven thermostat regulates the broiler temperature. One of the reasons an oven won’t heat is if the oven thermostat is defective. The oven thermostat contains a type of hydraulic fluid that expands as the temperature rises, putting pressure on a small activator inside the thermostat to shut off the heat. As the broiler cools, the pressure reduces and the activator allows the broiler to heat again. Unfortunately, the oven thermostat is difficult to test. If you suspect the thermostat is defective, it may need to be replaced. Parts: Temperature Control Thermostat- Know your oven model to order the correct part. Problem: If the bake/broil heating element has burned out the oven won’t heat properly. When the element is heating properly, it glows red hot. Carefully inspect the heating element for visible signs of holes or blisters. If there is no visible damage, then use a multimeter to test the element for continuity. If the heating element does not have continuity at any setting, replace it. 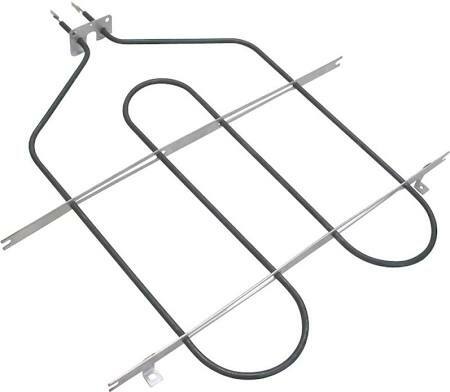 Parts: Bake/Broil Heating Element- Know your oven model to order the correct part. Problem: The relay board has several relays that regulate the electrical current to the heating element. If one or more of these relays is not working, the oven won’t heat. If any of the relays are defective, the relay board needs to be replaced. Not all ovens are equipped with a relay board. Check oven manual to determine if this could be a problem with your specific model. Parts: Relay Board (if equipped)- Know your oven model to order the correct part. Problem: The oven control board sends electrical current to the bake and broil circuits according to sensor input. However, this is not a common reason why an oven won’t heat. Before replacing the oven control board, check to see if any of the relays are defective, and if the other heating components are working properly. The oven control board is one of the less common oven repair parts, and if difficult to test. If after you’ve inspected the other heating components you suspect the oven control board is defective, it will need to be replaced. Parts: Oven Control Board- Know your oven model to order the correct part.